BRIDGEWATER, Mass. - The Cape Cod Tech/Cape Cod Academy boys hockey team delivered a statement victory Monday, routing East Bridgewater 11-2 at Bridgewater Ice Arena. "I'm just glad we got out of here with a win and we're all healthy," CCT/CCA head coach Curren Stockwell said. Backed by solid netminding and six second period goals from Cole Therrien, the Crusaders (2-2-1) captured their second straight win. 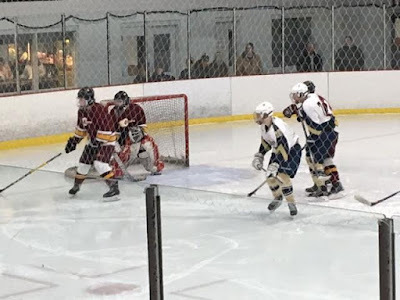 Despite being heavily outshot by East Bridgewater (2-3) through the first five minutes of play, CCT/CCA got on the scoreboard first via a Ryan Dipilato (three goals) wrap-around that beat Vikings' goalie Hunter Dempsey to his blocker side, drawing the Crusaders first blood. "He's been incredible," Stockwell said of Dipilato. "The fact that's he's only a sophomore is the unbelievable part." East Bridgewater, which registered 23 shots through the first 15 minutes, continued to dominate possession of the puck and with 4:17 left in the first, and Cole Bagley poked home a Bob Bumpus rebound to knot the score at 1-1. "I think we just came out flat with the long weekend and the holiday and everyone eating too much food," Rockwell said. "We just needed to wake up a little bit." Unfortunately for the Vikings, it was all Crusaders from there. 3:01 into the second frame, Therrien beat Dempsey with a wrist shot to his glove side to push CCT/CCA ahead 2-1. 54 seconds later, Therrien drilled one home glove side to make it 3-1. 24 second later, Therrien added his third goal to extend the Crusaders' advantage to 4-1. Therrien lit the lamp three more times before the end of the second as the Crusaders built a 7-1 cushion heading into the final 15 minutes. "Six goals in the second period speaks for itself," Stockwell said of Therrien. "He's a great player, unbelievable talent. I'm just glad he was shooting tonight instead of trying to deke by everybody." Ben Stacy's goal with 38 seconds remaining capped the scoring at 11 for CCT/CCA. Three Cougar goalies, beginning with Will Grindell, combined to tame the Vikings. "I thought it was great," Stockwell said of his team's goaltending. "The only goal in the first period was on a bad bounce on a rebound to an open net. That kind of stuff happens." East Bridgewater will square off against Dighton-Rehoboth/Seekonk Wednesday at 7:10 p.m.
CCT/CCA will battle Dennis-Yarmouth Wednesday at 8 p.m.